A rare summer visitant; hybrid pairings occurred with the Scarlet Tanager in 2003 and 2005. Formerly a spring visitant and fall vagrant; recently a regular spring and fall migrant. The Summer Tanager was very rare during the Minnesota Breeding Bird Atlas (MNBBA). The Summer Tanager has two widespread subspecies. The eastern nominative race, Piranga rubra rubra, is a slightly smaller bird but has a larger range and population. It is found throughout the Southeast, from southern Pennsylvania and Ohio west to southern Iowa, then south from Missouri to central Texas and eastward to Florida. The Western race, P. r. cooperi, is slightly larger but occupies a smaller range with a smaller population. It is found from northern Mexico and western Texas through New Mexico and Arizona, with local populations in southern Nevada and California. The highest breeding densities are found from southeast Oklahoma through northwest Arkansas to southeastern Missouri (Figure 1). A medium- to long-distance migrant that winters in the Neotropics from central Mexico to northern South America. The Summer Tanager is noted for feeding on bees and wasps, which it catches in flight by sallying. It then takes “prey back to perch, then beats prey by slamming it repeatedly against perch until dead; removes stinger by wiping prey on branch.” It also preys on the larvae of bees and wasps by killing the adults and then tearing open the nest (Robinson 2012). A variety of other insects are eaten, as well berries and fruits in season and the latter during migration and winter. Loosely constructed shallow-cup placed 3 to 10 m high, often in an oak, pine, or cottonwood. Breeding distribution and relative abundance of the Summer Tanager in North America based on the federal Breeding Bird Survey, 2011–2015 (Sauer et al. 2017). When Roberts compiled the information for the Summer Tanager in 1932, there were only two records of the species in Minnesota. One was a specimen collected in Pipestone County in late May 1891 and the second was a bird seen and well identified at Lake Pepin in Goodhue County on May 14, 1926. Green and Janssen (1975) found only 7 more reports for the next 40 years and concluded that the species was a casual spring migrant. The first record after 1926 was on June 8, 1952, when a bird was seen carrying food in Frontenac, Goodhue County (Lupient 1952). Four of the other early records were from the 1960s: 1 bird was seen in Winona County on June 14, 1963 (Shira 1964), 2 were seen in the same yard in Duluth on May 12–16 1964 (male) (Green 1964) and on May 19–24, 1965 (female) (Green 1965), and 1 was reported in 1968 in St. Paul (Olson 1968). In the 1970s 10 more records (8 spring and 2 fall) by active bird-watchers were published in The Loon. Three of these records included 3 specimens in the Bell Museum of Natural History that were found dead in early May (Janssen 1972; Winker and Warner 1991) in widely scattered counties: Becker, Hennepin, and St. Louis (Duluth). The other spring records from the 1970s were also widely scattered, coming from Hennepin, Lac qui Parle, and Lyon Counties. The 2 fall records were both of lingering migrants at feeders in the Duluth area from October 11–21, 1976 (Janssen 1976), and October 25–November 1, 1979 (Eckert 1979). The number of records of the Summer Tanager showed an obvious increase during the 1980s (19 spring records in 8 years and 8 fall records in 6 years) and the 1990s (from 1991 to 1998 the species was reported 1–4 times a year in the spring and 1–4 times most years in the fall). In 1999, there was a notable influx of spring migrants when 18 birds were observed from May 1 to May 29 in 12 counties in the southern part of the state, plus 3 in the north (in Aitkin, Lake, and St Louis Counties). All these records are well summarized in an article in The Loon (Bardon 1999), which also compiled all previous records (1963 to 1999) and showed that the spring records (75 records occurring from April 27 to June 24) were 3 times as numerous as the fall records (24 records occurring from late August to early December). Bardon also analyzed the stopover periods, which averaged 5 days for spring birds and 14 days for fall birds, a timing pattern that has been found for other displaced migrants. Bardon (1999) reported that the spring migrants from the 1960s to the 1990s consisted of “16 adult males, 21 immature males, and 3 females.” A map in Bardon’s article clearly showed that most records of these displaced migrants, spring and fall, were from locations with the most observers: the Twin Cities metropolitan area and the North Shore of Lake Superior. There is 1 unusual record of a bird lingering into late December at a feeder at Carlos Avery Wildlife Management Area, Anoka County (December 1–22, 1987; La Fond and La Fond 1988). In the seasonal reports of the Minnesota Ornithologists’ Union (MOU) database during the MNBBA (2009–2013), records for the summer months were either of late spring migrants, lingering individuals in June, or early migrants in August. Although these dates would be within the “safe dates” for nesting defined by the MNBBA (June 1 to August 1), there is no indication that the Summer Tanager has a viable population in Minnesota. Three records submitted to the MNBBA fit the pattern of the species wandering north of its normal breeding range (Figure 2): Rice County, June 4, 2011; Aitkin County, June 6, 2013 (at a feeder); and Blue Earth County, June 8 and 19, 2001. The “probable” record submitted to the MNBBA was reported in Afton State Park in Washington County on July 9, 2009, and again on July 18, when 2 males were heard; the report on July 25, 2009, was presumably the same bird(s) (Kessen and Svingen 2010). Tanagers may persist at Afton State Park, as shown by subsequent observations in 2014 (Kessen et al. 2015), 2015 (Kessen et al. 2016), and 2016 (June 5–21, 6 observations, MOU database query); however, no breeding evidence has been reported. The Minnesota Biological Survey also reported multiple observations in suitable habitat at Kilen Woods State Park in Jackson County on June 19 and 26, 2007 (Kessen and Svingen 2008). Breeding information regarding hybrid tanagers have fewer but similarly detailed records. In 2003 a male Summer Tanager was observed paired to a female Scarlet Tanager in 2 separate units of the metropolitan regional park system (Murphy-Hanrehan Park Reserve, Scott County, and Lebanon Hills Regional Park, Dakota County) and was well documented in The Loon (Fall 2003; Mattsson 2003). The outcome of these 2 hybrid pairings in separate parks was the same: both were observed feeding a fledgling Brown-headed Cowbird. In 2005 in Lebanon Hills Regional Park, Mattsson again found a male Summer Tanager paired with a female Scarlet Tanager, and his detailed observations “documented evidence of successful nesting and the production of a least one hybrid tanager” and one cowbird nestling. He concluded that “the presence of a female Summer Tanager near the male’s territory in 2005 indicated that production of pure Summer Tanager offspring is a realistic possibility in Minnesota” (Mattsson 2007). To fulfill that possibility, the presence of the Summer Tanager throughout June and July in suitable habitat should be carefully monitored. It is uncertain where the regular Summer Tanager migrants come from. The species is known to only breed sparingly in southern Iowa (Jackson et al. 1996). A more likely source population is in Missouri, where the Summer Tanager is a summer resident and is common in the pine-oak forests of the Ozarks (Jacobs and Wilson 1997), and in Arkansas, where it is common in the oak-hickory and pine-oak woodlands of the Ozark and Ouachita Mountains regions (James and Neal 1986). In Wisconsin (Robbins 1991) and South Dakota (Tallman et al. 2002), the Summer Tanager is a visitant in spring and a vagrant during fall migration. Records from the nineteenth and early twentieth centuries indicated that the Summer Tanager might once have bred in both states. In Iowa, the Summer Tanager has been a rare and local summer resident since the nineteenth century. Its breeding populations are along the Mississippi and Cedar Rivers in the east, the Des Moines River in central Iowa, and the Missouri River in the west (Kent and Dinsmore 1996; Jackson et al. 1996). The species was found in 3% of the blocks in Iowa’s first atlas (1985–1990) and in 11% of the blocks in its second atlas (2008–2012). Breeding distribution of the Summer Tanager in Minnesota based on the Minnesota Breeding Bird Atlas (2009–2013). Summary statistics for Summer Tanager records by breeding status category for all blocks and priority blocks (each 5 km × 5 km) surveyed during the Minnesota Breeding Bird Atlas (2009–2013). The eastern population breeds in deciduous forests, especially oak-hickory or oak-pine woods with canopy gaps, and in deciduous bottomlands and parks. Where the Summer Tanager is sympatric with the Scarlet Tanager, the former “prefers sites with shorter average tree height, less canopy cover and fewer tree species” and the latter “tends to be most numerous in closed-canopy forest, where the trees are taller” (Robinson 2012). The western population breeds in cottonwood-willow riparian woodlands. The Partners in Flight Landbird Conservation Plan 2016 estimates the combined United States and Canadian population at 12 million birds (Rosenberg et al. 2016). Trend analysis from the federal Breeding Bird Survey data shows that the breeding population across the United States has remained stable over both the long term (1966–2015) and the short term (2005–2015). 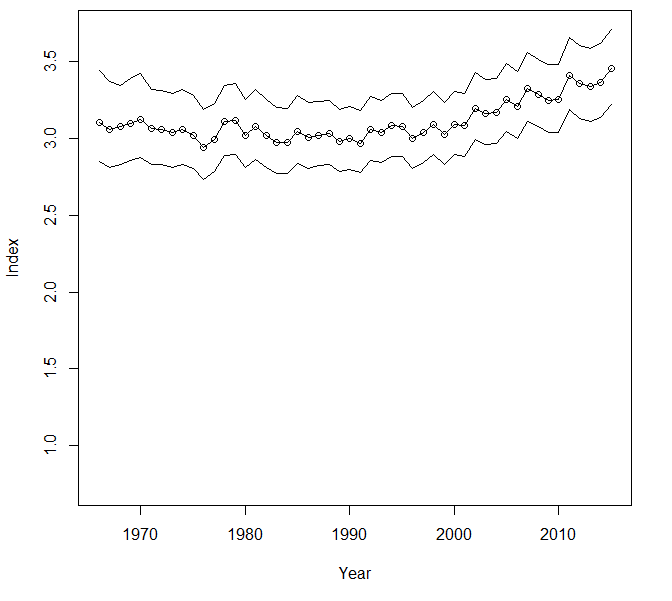 Trends in the United States significantly increased by 0.22% per year from 1966 to 2015, and by 0.61% per year from 2005 to 2015 (Figure 3). Rosenberg et al. (2016) estimated that the overall population of the Summer Tanager in the United States had increased by 9% from 1970 to 2014. Some populations show a significant long-term decline, such as in the Appalachians Mountains region (2.14% per year) and in Florida (0.97% per year). In the west, Robinson (2012) reported recent declines along the lower Colorado River, which may lead to the species’ disappearance; Robinson suggested that the primary reason for the decline is the conversion of riparian forest to agricultural lands. Breeding population trend for the Summer Tanager in the United States for 1966–2015 based on the federal Breeding Bird Survey (Sauer et al 2017). Partners in Flight assigned the Summer Tanager a Conservation Concern Score of 9/20, which is at the low end of the “moderate concern” range (Rosenberg et al. 2016). The International Union for Conservation of Nature (IUCN) assigned it a conservation status of Least Concern. In California, it is listed as a Species of Special Concern because of habitat loss in the lower Colorado River valley, though this status does not give it any legal protection. The species is not mentioned in management plans in other states, but Robinson (2012) emphasized that action is necessary to protect breeding and stopover migration habitat. Langham et al. (2015) and the National Audubon Society (2015) does not mention the Summer Tanager as a species of concern in relation to climate change, largely due to its southern distribution and the possibility of additional habitat to the north. As with many species that have major distributions south of Minnesota, the Summer Tanager should be looked for in suitable habitats in Minnesota, especially in the southern and central forested regions. This beautiful red bird is a treat to observe and is likely a welcome addition to the Minnesota avifauna. Bardon, Karl J. 1999. “An Influx of Summer Tanagers.” Loon 71: 216–220. Eckert, Kim R. 1979. “Summer Tanager at Duluth.” Loon 51: 207. Fall, Bruce A. 2003. “Summer Tanager / Scarlet Tanager Mixed-Species Nesting.” Loon 75: 221–225. Green, Janet C. 1964. “Male Summer Tanager in Duluth.” Loon 36: 63. Green, Janet C. 1965. “First Summer Tanager Banded in Minnesota.” Loon 37: 113. Jacobs, Brad, and James D. Wilson. 1997. Missouri Breeding Bird Atlas: 1986–1992. Natural History Series, no. 6. Jefferson City: Missouri Department of Conservation. Janssen, Robert B. 1972. “Summer Tanager at Detroit Lakes.” Loon 44: 53. Janssen, Robert B. 1976. “Fall Summer Tanager.” Loon 48: 176–177. Kessen, Ann E., and Peder H. Svingen. 2010. “The Summer Season 1 June through 31 July 2009.” Loon: 82: 7–34. Kessen, Ann E., Peder H. Svingen, and Paul E. Budde. 2016. “The 2015 Summer Season 1 June through 31 July 2015.” Loon 88: 6–31. La Fond, Pat, and Ken La Fond. 1988. “A Winter Summer Tanager.” Loon 60: 135. Lupient, Mary. 1952. “Seasonal Report.” Flicker 24: 119–124. Mattsson, James P. 2003. “Summer Tanager and Scarlet Tanager: Interspecific Pairing in Minnesota.” Loon 75: 226–230. Mattsson, James P. 2007. “A Nesting Summer Tanager X Scarlet Tanager in Minnesota.” Loon 79: 7–10. Olson, Manley E. 1968. “Summer Tanager Seen in St. Paul.” Loon 40: 59. Shira, A. F. 1964. “Summer Tanager Seen in Winona County.” Loon 36: 31. Winker, Kevin, and Dwain W. Warner. 1991. “Notes on the Distributions of Some Minnesota Birds.” Loon 63: 168–170.